Mohan Babu looks impressive in the teaser and trailer, and these are the kinds of roles that he pulls off with utmost ease. 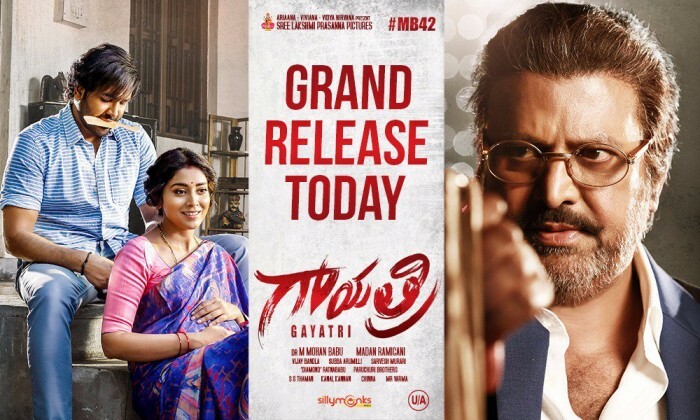 Actor Mohan Babu will be seen playing dual role in his upcoming film Gayatri which is hitting the screens today. Directed by Madan, Gayatri will have the actor essaying dual roles, both the protagonist and the antagonist. The film also stars Manchu Vishnu and Shriya Saran in pivotal roles besides Mohan Babu. The teaser and trailer of the film look promising and indicate the kind of subject the film would have. Mohan Babu looks impressive in the teaser and trailer, and these are the kinds of roles that he pulls off with utmost ease. As the film gears up to hit the screens today, we take a look at top reasons to watch Gayatri starring Mohan Babu on first day. Crowned Collections King, Mohan Babu is one of the seasoned actors in Tollywood and his look in the film looks intriguing. The teaser and trailer and have created quite an excitement around the film, and the actor’s dialogues in the film has drawn a lot of attention of the audiences. Vishnu will not be seen playing a stereotype lead role in Gayatri but instead would be seen playing a brief role in the film. The first look posters of the actor released a while ago have been impressive and is one of the reasons why we feel this movie needs to be watched first day. After having played varied roles, Shriya Saran is now doing roles with substantial contribution to the story. The first look poster of Shriya from Gayatri was very impressive in which the actor looked simple yet beautiful in a saree. Shriya hasn’t sported such a subtle look in her career so far. This filmmaker is making a comeback after a long time in Tollywood. After a hiatus, Madan picked a thriller like Gayatri to make a comeback and the film promises to be an intriguing one. Having made films like Pellaina Kothalo, it will be interesting to see how Madan would have handled such thriller. This music composer is on a roll this year with numerous films lined up for release. With already a hit in Bhaagamathie under his belt, Thaman will be composing music for this film. With intense scenes involving Mohan Babu, it will be interesting to see the sounds Thaman would choose to elevate the scenes further.